The Nano Membrane Toilet is a waterless, self-contained toilet for households of up to 10 people that has been in development since 2012. 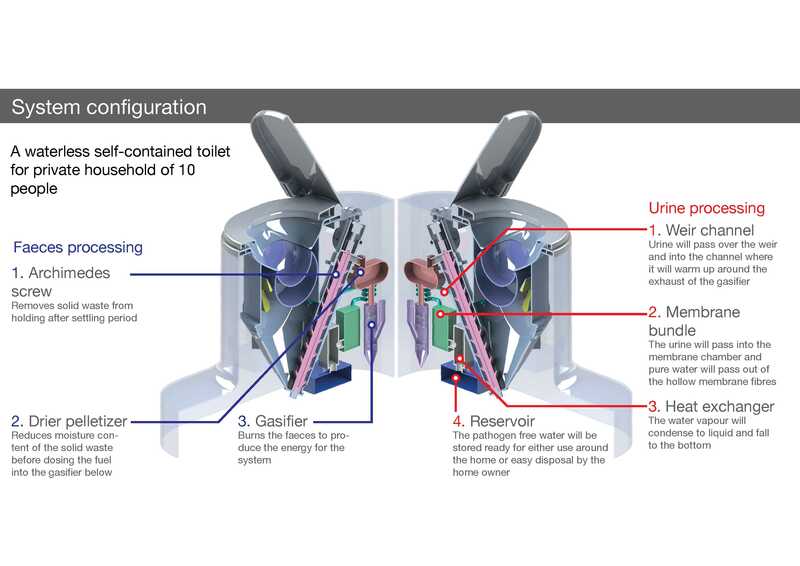 While the challenge we face – reinventing the toilet to provide access to safe and affordable sanitation – has not changed, much of the technology in the toilet itself has been refined and adjusted. From the outside, early prototypes and our most recent prototypes look very similar. We’ve always believed that the Nano Membrane Toilet should have an aspirational design and that it should have a small enough footprint to fit in a low income household. However, on the inside, things have been changing. One of the biggest shifts has been the end of the process for solid waste (faeces). Our initial design sent waste up an Archimedes screw to a misting chamber. As the waste fell from the top of the screw and landed in a collection chamber it was misted with paraffin wax. This could stop the pathogens escaping while letting the waste dry out. However, working with colleagues in Energy at Cranfield, we have come up with a new solution. A gasifier can convert the solid waste to harmless ash. And, in doing so, it is able to produce the energy required by the other processes in the toilet (like the membrane processes which turn urine into safe water). We are also hoping that this process will even produce excess energy which could charge mobile phones or other low voltage electronics. This is clearly a better and less wasteful solution. Elsewhere in the inner and outer workings of the toilet we have been experimenting and making adjustments to every aspects of the toilet. Members of the team have been refining the flush, for example, to make sure the bowl is clean every time. Other team members have been looking at how we can tweak the Archimedes screw to make sure it works effectively. We know that every single aspect has to be checked and trialled to ensure the toilet is reliable as well as easy to use. To reflect some of the changes we’ve made in the design, we’ve produced a refreshed diagram reflecting the most recent changes (see image above). In our labs, we’re still hard at work reinventing the toilet – but we’re looking forward to seeing what the future holds for this invention. 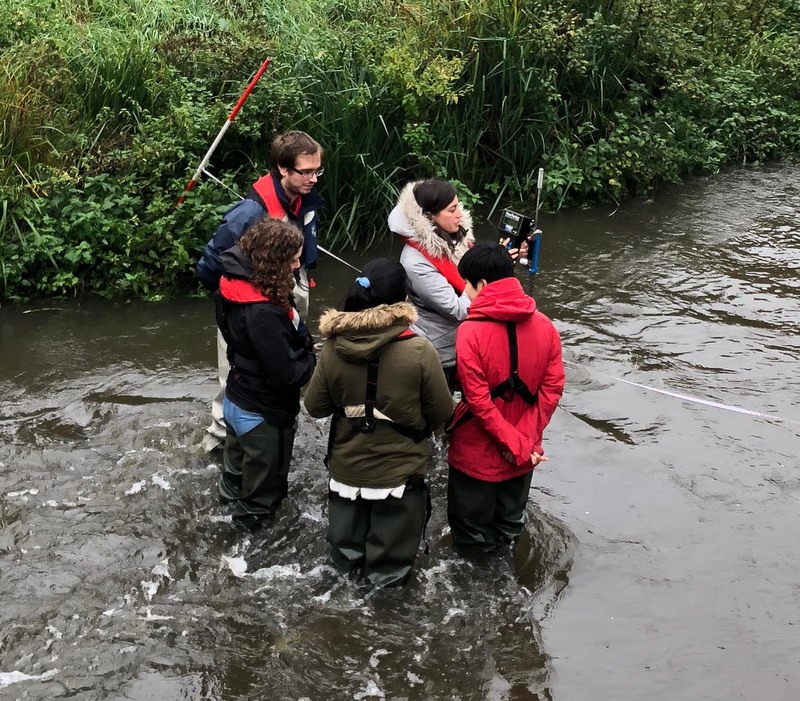 Dr Alison Parker is engaged in research and teaching at Cranfield University in water and sanitation in low income countries. She is leading Cranfield University's response to the Bill and Melinda Gates Foundation's challenge to "Reinvent the Toilet", using novel membrane technology to treat human waste on-site. She is also involved in developing and testing technologies to treat faecal sludge from pit latrines and container toilets including anaerobic digestion and pyrolysis. This involves characterising the waste and optimising its reuse. She is working at both ends of the technology development process - helping to develop a novel technology for EPSRC and in testing "off the shelf" systems for WSUP.